An outstandingly beautiful valley set deep in the Karakorum, some of the highest and most spectacular mountains on earth. An ancient principality with a romantic but bloody history. Beautiful walks around Hunza proper, high above the torrential Hunza river, along irrigation channels and lanes, through apricot orchards, cultivated terraces and timeless hamlets. Superb walks from the main valley up to glaciers and high viewpoints and in the mountains of the surrounding area. And also off the Karakorum Highway to the north and south. This area is sadly currently too dangerous to visit (Talibanned). Lets hope! The Hunza valley is justly famous for its beauty, isolation and romance although its history as a wild mountain principality has often been bloody. The Hunza is the only valley to cut through the vast Karakoram massif, starting near the Khunjerab pass to China and winding through the range before joining the Indus. The valley is surrounded by magnificent peaks, the most famous being the stunning Rakaposhi, at 7,788m, and valleys and glaciers. Although high (around 8,500ft), Hunza proper has a benign microclimate; with a vast network of ancient irrigation channels, it supports cereal crops as well as its famous apricot orchards. You can walk along channels and lanes, through orchards, steeply terraced fields and timeless hamlets. You may hear the Muezzin's call from a rickety little mosque. There are many outstanding walks to be made in the mountains above Hunza, to glaciers and high ridges from which you will be surrounded by the glistening peaks of the high Karakoram. One of the best is the steep walk (one to three days) up to Ultar Meadow, with a view of Ultar Peak (7,388m) looming behind its steep, narrow, dirty glacier, and beyond to a view point on a high ridge at Hon. 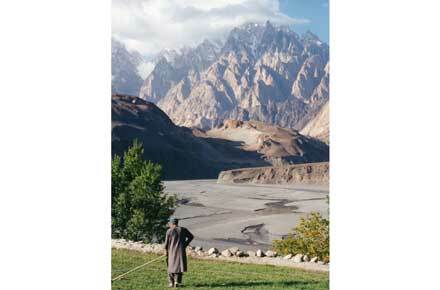 There are wonderful walks both up and down river from Hunza. The Lonely Planet has a lot of fabulous suggestions. We plan to develop a lot more information about these walks (all recommendations welcome! ), but in the meantime see Hussaini to Zarabad. See the warnings elsewhere about the dangers of this area.